On Friday morning, following presentations by two young “agripreneurs,” participants reconvened in thematic groups to finalize their messages and collective actions for inclusion in the GCARD3 Outcomes Statement. In the afternoon, participants convened in plenary for presentation of the Youth Agripreneurs Project (YAP) awards. Peter Casier, Independent Consultant, introduced five of the six YAP finalists from Barbados, India, the Philippines, Ethiopia and Kenya who each described their winning projects. Following an overview by Chairs and Co-chairs of the key messages from the two days of thematic discussions, Shadrack Moephuli, President and CEO, ARC, presented the draft GCARD3 Outcomes Statement for adoption. He noted that the Outcomes Statement sketches the overall context of the GCARD3 Global Event and the five key challenges that were explored during the thematic discussions. 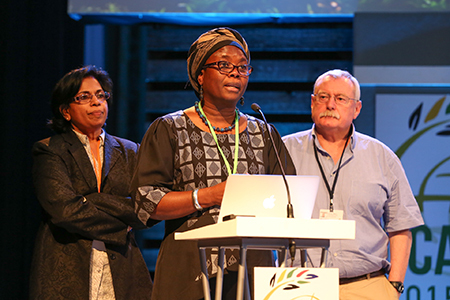 Moephuli then highlighted the main messages and commitments that emerged from the five thematic groups, noting commitments to, inter alia: establish innovative, farmer-led platforms; create 1,000 additional PhDs per year in “next-generation, future-relevant agricultural research”; continue professional development in agriculture for innovation and entrepreneurship; develop a “culture of impact”; contribute to national measurements of progress and create a platform to harmonize agriculture-related indicators linked to the Sustainable Development Goals (SDGs); build value chain partnerships, while protecting smallholder farmers’ access to resources and developing their business skills; and address cross-cutting themes such as public health and nutrition in agricultural research and innovation programmes. A final high-level panel discussion moderated by Frank Rijsberman, CEO, CGIAR Consortium, provided regional and global perspectives relating to the GCARD3 outcomes. For the full story, including a summary of proceedings and speakers' remarks, please visit the dedicated page of IISD Reporting Services, providing daily web coverage from GCARD3, through its ENB+ Meeting Coverage.